I'm hunting for a 'lace wars' era rule set that I like enough to play regularly. One of the local gamers handed me a big box of unpainted lead (15mm scale isn't something he wants anymore) for the era. I'm planning on painting up an 'imagi-nation', but basing and unit sizes somewhat depend on rules so....the hunt is on. My erstwhile opponent, Tommy, came into a large lot of prussians based and painted for Age of Reason. It seemed to be the most simple approach to try these rules first. 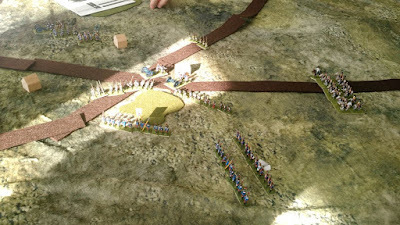 We chose a relatively small set of matched forces (4 units infantry (inc 1 grenadier), 2 units can (light and med), and 2 cannon). Consulting Charles Grants 'Programmed Wargame Scenarios' we found that we were advance guards coming from the East/West trying to seize the cross roads. 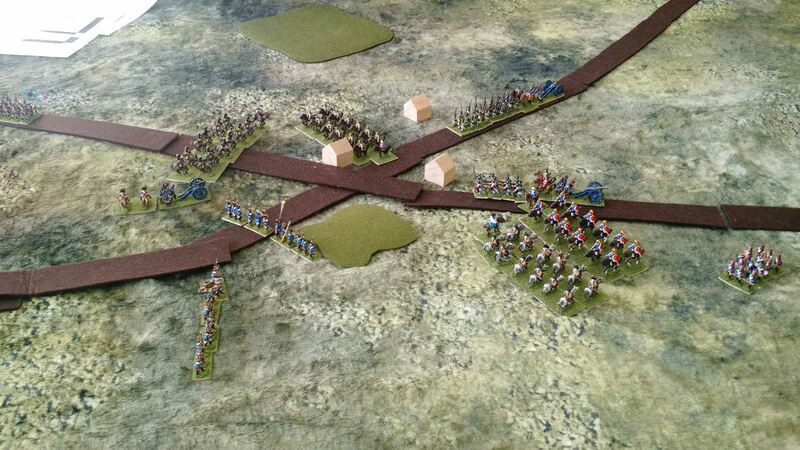 Tommy was meant to form a line of battle North/South at the crossroads. 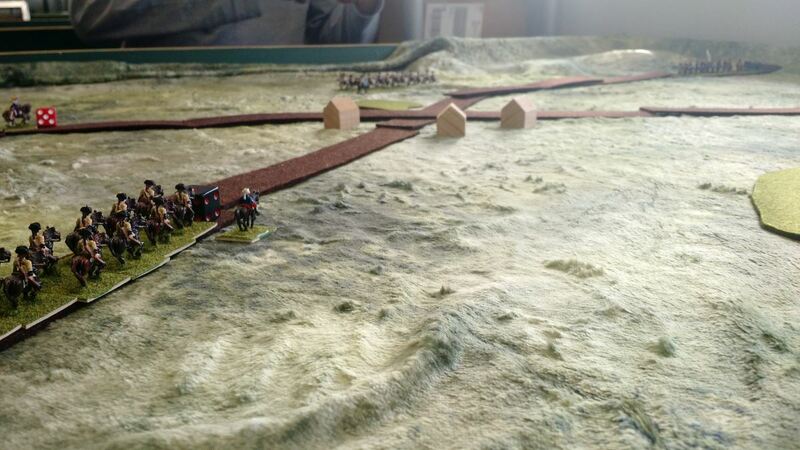 I was meant to 'seize the heights' which involved marching past to the South West and occupying the hills. Obviously these were incompatible plans so things got bloody. I find it interesting when rules do cause 'historical' engagements. We had lots of failure of nerves to actually close into melee. 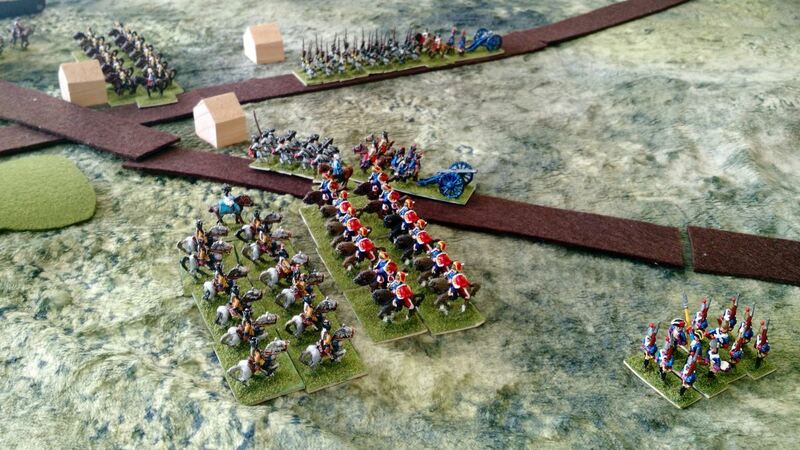 Our cavalry clashed early/first and each side had a unit run off the table (dragoons beating hussars in both cases). 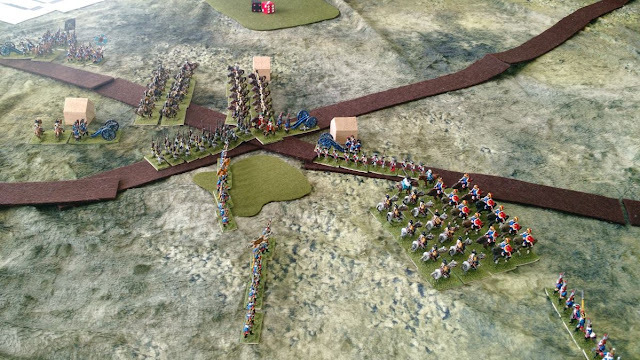 It was actually more effective for grenadiers to advance to musketry range and blaze away at a lesser unit than (fail to) charge in. Some mistakes were made. 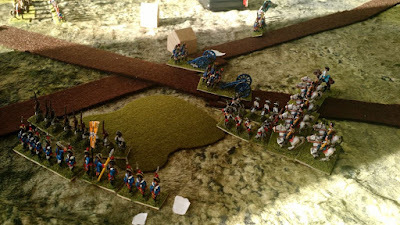 The artillery was overly effective for the first couple salvos (1/2 of an infantry unit disappeared in a pink mist at one point). 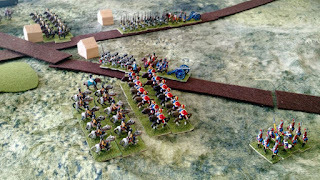 The cavalry also tested their ability to close to combat incorrectly early, so there probably would have been even fast clashes at the beginning. We played for 3 hours before running out of time. I suspect we were pretty close to a decision. Tests to withdraw were being made (although currently at a 12 on 2 dice). More importantly a lot of units were worn and likely to leave with a few more casualties. I'd be willing to give these rules another go, having gotten up to speed on them. 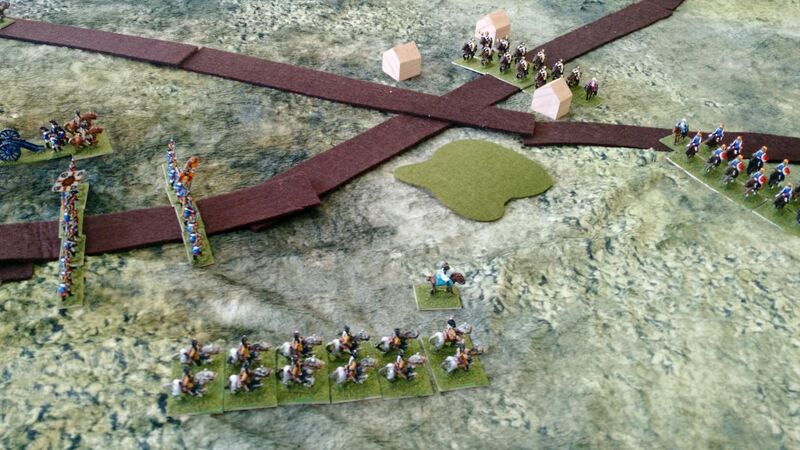 Our plan is to try the same forces/scenario with a different ruleset next month for comparison. Hi Dave, Jeff gifted me Beneath The Lily Banners, first edition. They are designed for the period of 1660 to 1720's so they may be a little early for your period. You are welcome to try them if you like. I plan on coming down in the next month so we could meet and I could drop them off if you are interested. That would be great. I'd be happy to take a look at them. Since I'm not playing specifically historical it's probably not too big of issue to be 'too early'. Dave, you follow a sensible path toward rules acquisition. That is, dip your toes into a number of different pools using small forces and see which feels right to you and your gaming partner. 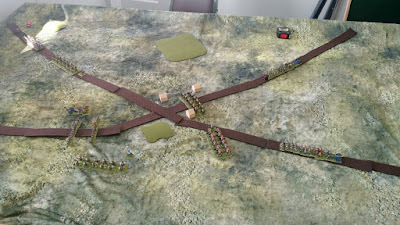 I have been using Honours of War (HoW)for SYW battles. While bloody, they produce a good game and provide many interesting decisions and challenges to players. I like the rules. The author's approach tends to capture my own philosophy in that combat is focused on unit cohesion and not so much casualty counting. Units are either combat effective or not. 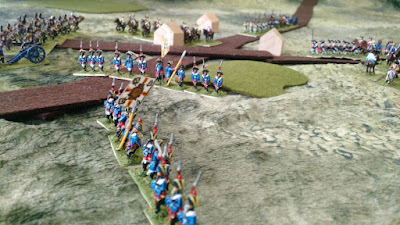 The rules offer online support via the forum (http://honoursofwar.com/). Thanks for the tip Jonathan. I'll check out some reviews and maybe flip through the book if one of the local(ish) stores carries it. The book is available via kindle for a nominal price. Thanks for the description/play through of Age of Reason. I always like learning about rule sets, and I find playthroughs and the impressions that the players communicate to be much more helpful than reviews or worse, company promos. One of the reasons I like going to conventions is to try a bunch of rules I've heard or read about but am not willing to jump into a purchase without playing. I was pleasantly surprised with age of reason. It's from an era that has a LOT of overly complex kludgey rule sets. I wouldn't describe it as slick and modern, but it seemed to flow reasonably once you were getting used to the various modifiers. I've little familiarity with this setting so can't offer help on hunting down a good rules set, but your game looked fun at least. I think the somewhat random programmed scenario helped. Line em up, knock em down doesn't appeal too much to me anymore. And having an NPC come up with a battle plan you can blame for your poor performance is lovely! Everybody's favorite Herald of the Apocalypse. Many (most) images are lifted without attribution from the internet. I am happy to give appropriate citation when asked (and/or removal of pictures). No infringement is intended on original work, copyright, IP, etc.